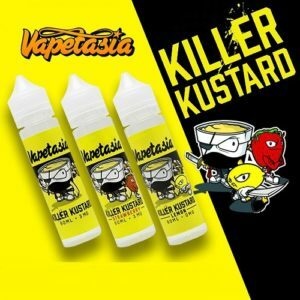 As a custard e-liquid blend that resonates with vapers worldwide, it’s easy to see why Killer Kustard is Vapetasia’s pride and joy. The smooth experience it delivers will leave you itching to make a bowl of custard, which demonstrates the exciting impact it will have on your taste buds. When you examine the flavors and vaping experience a little further, it’s easy to see why it’s an award-winning product. It has a low throat impact, it produces impressive clouds of smoke that carry intense aromas. Together, these features will bring your senses to life as no other vape can. If you’re searching for an exciting blend of tangy and sweet tones, Killer Kustard by Vapetasia is the one for you. Killer Kustard Vanilla – Creamy vanilla custard, an enchanting mix of vanilla and custard flavours. If you’ve been searching for the perfect level of sweet and savoury then look no further; simply put, Killer Kustard is the smoothest, richest and most delicious custard that you can get your hands on. You’ve been warned! This one is hard to put down! Killer Kustard Blueberry – freshly picked Blueberries mixed with their signature creamy Vanilla Custard. Killer Kustard Honeydew – this new honeydew concoction brings a fresh twist of flavor with fresh, juicy sliced honeydew melon blended with their creamy vanilla custard masterpiece, you can’t go wrong with this vape juice if you’re either a creamy vape or fruit vape lover. Killer Kustard Lemon – incredible vanilla custard swirled with a gorgeously creamy lemon curd and a zesty citrus finish that will explode on your tastebuds. This Custard is no ordinary e-juice, you will come back to time after time. Good luck putting this flavour down. Killer Kustard Strawberry – Rich and creamy clouds of vanilla custard combine with hints of ripe strawberries! 50ml 0mg short fill ready for you to add your own nicotine shot.